During the production of the API steel pipe, a main kind of the welded steel pipes, it has obvious brittleness of high temperature tempering, causing lower and unstable impact strength. There are two methods to address this problem. One is to use fast cooling after tempering to avoid high temperature brittleness and gain toughness. The other way is to uses subcritical quenching, through the incomplete austenitizing of the steel to improve harmful elements and impurity so as to promote toughness. The first method has strict requirements to the equipments for heating processing, needing to add extra cost. The temperature of the heating temperature of the subcritical quenching should be chosen between 740 degrees and 810 degrees. If choose the heating temperature of the subcritical quenching is 780 degrees, the holding tome of the quenching as well as heating should be 15 minutes. The temper temperature after quenching is chosen as 630 degrees, the heating as well as holding time of tempering should be chosen as 50 minutes. The subcritical quenching is heated between α+γ two phase regions, and carry out quenching under the condition of the non-dissolution ferrite in reserve parts, which ensure the higher strength and improve the toughness at the same time. In addition, the general temperature of the low temperature harden by quenching is low, which reduces the internal stress of the hardening by quenching, so as to reduce the deformation of the quenching. And then it makes sure the successful operation of the production of the heat treatment. And at the same time, it offer excellent raw materials to the subsequent lathe thread process. The API steel pipe is a kind of tube stock with large diameter. The welded steel pipe and black steel pipe are also available. Its function is to fix the wall of a well or hole of a well of the oil well and natural gas well. The casting pipe is going to insert into the hole of a well and fix through the cement to avoid the slumping of the well and the separation of the well and the rock stratum, ensuring the circular flow of the hydrocarbon exploration, which is beneficial to drilling as well as exploiting. In addition, use API steel pipe with different styles in the middle of the oil exploitation. Surface oil casting is to protect the well drilling and prevent it from the pollution of the shallow water layer as well as the shallow gas layer. And its another function is to support wellhead equipment and maintain the weight of other layers of the API steel pipe. Protection string is to separate pressure of different layers so as to protect the normal circulation of the quota of the drilling fluid as well as protect production casting. 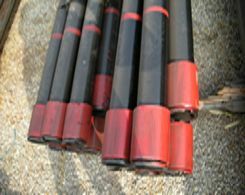 And it also beneficial to installing anti-burst device, leakage proof device as well as tail pipe inside of the drilling well. As for the oil string casting, its function is to lead out natural gas and oil from the store layer under the earth's surface to protect well drilling and layer the drilling mud. In the middle of producing API steel pipe, it is general that the outer diameter is 114 millimeters to 508 millimeters.